“Keeping up with the Jones’” may be a trite saying, but for those who follow the fashionable world of interior design, being on the leading edge of a trend is the goal. No one wants to be caught with décor that was “so last year” (sarcasm intended!). Why pay attention to trends? Well, for those of us who value comfort, as well as style, what’s trendy may not be as important when it comes to furnishing and decorating our homes. However, if you are planning to sell your home in 2019 and have budgeted for a few updates to sweeten the pot for potential buyers, then having a bit of knowledge about what trends buyers might be looking for in a home could benefit you. Making high impact but low budget updates to your home could be the ticket to attracting more buyers and higher offers. Our advice with any of these trends is to tread lightly. What is on trend now, may not be by next year. Especially if you plan to put your home on the market, we can help you make wise choices on where to spend your redecorating dollars for the greatest impact. Cherry cabinets are out, according to Elle. What’s trending are painted cabinets in dark, rich hues, like deep blue, grey and black. While marble and natural stone countertops are still in, you will find them in darker, warmer colors, as well. Instead of the crystal chandelier or stainless steel lighting, opt for handmade, sustainable fixtures made of bamboo, jute, rice paper, or other natural fibers. Designers are also liking bold and striking patterns for backsplash tile. Take it in stride but all black bathrooms, from the paint, to the sink, counter, and cabinetry are the style trend for 2019. The look is sultry, and evokes the high-end spa experience, so if you choose this look, don’t skimp on materials. 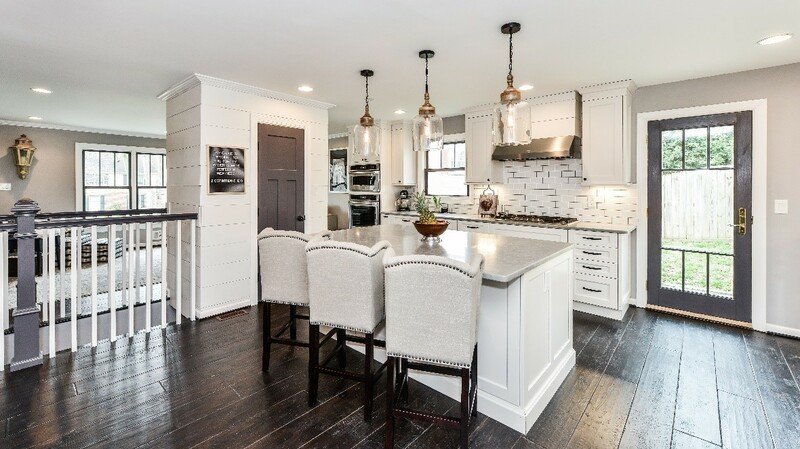 However, our advice is to make sure you are going to love it for awhile, because changing out fixtures for something different in a few years could break the budget and styles this bold will not necessarily appeal to the general public and could easily end up turning away buyers. Terrazzo tile and dark hardwoods are out. According to Elle, lighter woods are making a comeback in flooring, as the color makes a room feel brighter and more spacious. Rugs and carpet should be thick and luxurious. Flooring is an expensive design change, so choose the materials that work best with your space. We can help you choose flooring that will appeal to potential buyers and have a lifespan beyond what’s trendy. Mixing and matching metals was once considered a no-no, but no more. Blend brass or gold accents with oil-rubbed bronze or aged iron. The cooler tones of silver and pewter go well with bronze and black or brown-colored metals. However, over indulging in a single (or matching) metals, such as brass lighting, sink fixtures, and drawer pulls, are out for 2019. Believe it or not, acrylic accent tables are expected to be big, as they let the color and light of the décor shine through without competing or overpowering the look. We’ve already talked some about color in the kitchen and bathrooms, but what about the rest of the home?It seems as though color is definitely in. Walls are the backdrop to the furnishings and décor in the room and should be the foundational layer for any design. Bold colors are finding their way into living rooms, dining rooms, and family rooms, especially blues and greens, in jewel tones or deep and mysterious hues. Grey on grey is passé, but layer that grey with some other colors and textures, and you’ll have a fresh style for the new year. We recommend experimenting with color through the use of accessories that can easily and inexpensively be swapped out when your tastes change. For instance, throw pillows, rugs, picture frames, and other accessories can bring a pop of color to any room without having to repaint. It’s great fun to think about trending designs in interior decorating, but keep in mind that you are the one that lives in the home. If you are staying in your home long-term, then make the changes that will bring you comfort and happiness, instead of focusing just on what’s trendy. If you are planning to sell soon, then a few simple and inexpensive updates can make all the difference in how well your home shows. Consult a REALTOR® before making more expensive updates (like floors or countertops), so that your choices fit with what local buyers are looking for. Our team of experts can help you decide which updates will get you the most bang for your buck when preparing your home for sale. When it comes to buying or selling your home, we are here to help answer any questions and guide you through a better understanding. Please do not hesitate to contact us at info@piersonrealestate.com or phone us at 202.800.0800.